صالحی نژاد, نسرین, درتاج, فریبرز, سیف, علی اکبر, فرخی, نورعلی. (1396). اثربخشی بستة آموزشی مبتنی بر نرم‌افزار چندرسانه‌ای ساخت نقشة ذهنی بر مهارت‌های شناختیِ درسِ علوم در دانش‌آموزان دختر پایة هشتم. نشریه پژوهش در نظام های آموزشی, 11(38), 7-37. نسرین صالحی نژاد; فریبرز درتاج; علی اکبر سیف; نورعلی فرخی. "اثربخشی بستة آموزشی مبتنی بر نرم‌افزار چندرسانه‌ای ساخت نقشة ذهنی بر مهارت‌های شناختیِ درسِ علوم در دانش‌آموزان دختر پایة هشتم". نشریه پژوهش در نظام های آموزشی, 11, 38, 1396, 7-37. صالحی نژاد, نسرین, درتاج, فریبرز, سیف, علی اکبر, فرخی, نورعلی. (1396). 'اثربخشی بستة آموزشی مبتنی بر نرم‌افزار چندرسانه‌ای ساخت نقشة ذهنی بر مهارت‌های شناختیِ درسِ علوم در دانش‌آموزان دختر پایة هشتم', نشریه پژوهش در نظام های آموزشی, 11(38), pp. 7-37. صالحی نژاد, نسرین, درتاج, فریبرز, سیف, علی اکبر, فرخی, نورعلی. اثربخشی بستة آموزشی مبتنی بر نرم‌افزار چندرسانه‌ای ساخت نقشة ذهنی بر مهارت‌های شناختیِ درسِ علوم در دانش‌آموزان دختر پایة هشتم. نشریه پژوهش در نظام های آموزشی, 1396; 11(38): 7-37. 1دانشجوی دکتری روان‌شناسی تربیتی، دانشگاه آزاد اسلامی، واحد علوم و تحقیقات تهران، ایران. 4دانشیار، گروه سنجش و اندازه‌گیری، دانشگاه علامه طباطبائی، تهران، ایران. مطالعة حاضر با هدف تعیین اثربخشی بستة آموزشی مبتنی بر نرم­افزار چندرسانه­ای ساخت نقشة ذهنی بر مهارت­های شناختیِ درسِ علومِ دانش­آموزان دختر پایة هشتم در سال تحصیلی 96-1395 انجام شده است. روش پژوهش، از نوع آزمایشی با طرح پیش­آزمون_ پس­آزمون با گروه کنترل بود. جامعة آماری پژوهش، کلیة دانش­آموزان دختر پایة هشتم مدارسِ دارای امکانات سخت­افزاریِ شهرِ کرمان بودند، که درمجموع تعداد 40 دانش­آموز با استفاده از روش نمونه­گیری خوشه­ای ­چندمرحله‌ای به‌عنوان نمونه انتخاب و به شیوة تصادفی در دو گروه (20 نفر گروه آزمایش و 20 نفر گروه کنترل) جایگزین شدند. در پیش­آزمون و پس­آزمون همة شرکت­کنندگان، با استفاده آزمون پژوهشگر ساختة مهارت­های شناختیِ درسِ علوم، شامل 60 سؤال چهارگزینه‌ای و 10 سؤال تشریحی، مورد ارزیابی قرار گرفتند. گروه آزمایش در 10 جلسة دوساعته بستة آموزشی مبتنی بر نرم­افزار ساختِ نقشة ذهنی و گروه کنترل آموزش مرسوم را از طرف معلم دریافت کردند. جهت تحلیل داده­های آماری از تحلیل کوواریانس تک­متغیری (ANCOVA) استفاده شد. نتایج پژوهش نشان داد، دانش­آموزانی که بستة آموزشی مبتنی بر نرم­افزار ساختِ نقشة ذهنی را آموزش دیدند، نمراتِ بالاتری در مهارت­های شناختی کل و همچنین در کلیة سطوح مهارت­های شناختی به‌ویژه مهارت‌های (یادآوری، فهمیدن، کار بستن، تحلیل) کسب کردند. بر اساس نتایج این مطالعه پیشنهاد می­شود، نقشه­های ذهنی به‌عنوان ابزاری جهت فعال کردن یادگیری­های قبلی دانش­آموزان و ایجاد ارتباط بین مفاهیم درسی به‌منظور درک هر چه‌بهتر مطالب، در آموزش و تدریس مورداستفاده قرار گیرند. سیف، علی‌اکبر. (1394). ساختن ابزارهای اندازه‌گیری متغیرهای پژوهشی در روان‌شناسی و علوم تربیتی (ویرایش دوم). تهران: نشر دیدار. کرمی، زهره و اسدبگی، پژمان. (1394). توسعه سازمان‌دهی ذهنی یادگیرندگان از طریق شیوه‌های متنوع استفاده از نقشه‌های ذهنی در فرایند یاددهی یادگیری. دومین کنفرانس ملی توسعه پایدار در علوم تربیتی و روان‌شناسی. تهران: مطالعات اجتماعی و فرهنگی. حافظ­نیا، محمدرضا. (1391). مقدمه‌ای در روش تحقیق در علوم انسانی. تهران: سمت. کبیری، مسعود؛ کریمی، عبدالعظیم و بخشعلی زاده، شهرناز. (1395).یافته‌هایملیتیمز2015 روند 11 سالهآموزشعلوموریاضیاتایراندرچشم‌اندازبین‌المللی. تهران: مؤسسه فرهنگی مدرسه برهان ) انتشارات مدرسه). کریمی، عبدالعظیم؛ بخشعلی زاده، شهرناز و کبیری، مسعود. (1391). نتایج تیمز و پرلز 2011 و مقایسة آن با عملکرد دانش‌آموزان ایرانی در دوره‌های قبل. تهران: مرکز مطالعاتی تیمز و پرلز. کمالی محمدزاده، فریده؛ هروی، مریم و حسین پور، حسن. (1394). بررسی اثربخشی برنامه تدریس مجموعه‌ها با استفاده از نقشه ذهنی. سومین کنفرانس ملی روان‌شناسی و علوم رفتاری. تهران: موسسه اطلاع‌رسانی نارکیش. مرکز ملی مطالعات تیمز و پرلز. (1388). مهم‌ترین یافته‌های پژوهشی مطالعات تیمز و پرلز (عبدالعظیم کریمی). قابل‌دسترس در سایت مرکز ملی مطالعات تیمز و پرلز www.timsspirls.ir. Abi-El-Mona, I., & Abd-El-Khalick, F. (2008). The influence of mind mapping on eighth graders’ science achievement. School Science and Mathematics, 108 (7), 298-312. Akdal, D., & Sahin, A. (2014). The effects of intertextual reading approach on the development of creative writing skills. Eurasian Journal of Educational Research, 54, 171-186. Aktamis, H., & Yenice, N. (2010). Determination of the science process skills and critical thinking skill levels. In H. Uzunboylu (Ed. ), Innovation and creativity in Education, 2, 3282-3288. Amma, C. (2005). Effectiviness of Computer Based Mind Maps in the Learning of Biology at the Higher Secondary Level. ICDE International Conference, New Delhi, 19-23. Anderson, L. W., & Krathwohl, D. R. (Eds.). (2001). A Taxonomy for learning, teaching and assessing: A Revision of Bloom's Taxonomy of Educational Objectives: Complete edition. New York: Longman. Antonacci, P. (1991). Students search for meaning in the text through semantic mapping, Social Education, 55, 174-194. Aydin, H., & Tonbuloglu, B. (2014). Graduate students perceptions’ on multicultural education: A qualitative case study. Eurasian Journal of Educational Research, 57, 29-50. Aykac, V. (2014). An application regarding the availability of mind maps in visual art education based on active learning method. Procardia - Social and Behavioral Sciences, 174, 1859-1866. Balim, A, G. (2013). The effect of mind-mapping applications on upper primary students’ success and inquirylearning skills in science and environment education. International Research in Geographical and Environmental Education, 22(4), 337-352. doi: 10.1080/10382046.2013.826543. Batdi, V. (2015). A Meta-analysis Study of Mind Mapping Techniques and Traditional Learning Methods. Anthropologist, 20(1, 2), 62-68. Beydoghan, H. O., & Hayran, Z. (2015). The Effect of Multimedia-Based Learning on the Concept Learning Levels and Attitudes of Students. Eurasian Journal of Educational Research, 60, 261-280. Bitter, G. G., & Legacy, J. M. (2008). Using Technology in the classroom (7th ed). Boston: Pearson Publishers. Brinkmann, A. (2014). Mind Mapping as a Tool in Mathematics Education. journal of National Council of Teachers of Mathematics Stable, 96(2), 96-101. Buzan, A. (2007). Mind Maps. New York: Oxford Press. Buzan, T., & Buzan, B. (2015). Zihin haritalari. Cev. Guntulu Tercanli. 4. Baski. Istanbul: Alfa. Buzan, T., Dottino, T., & Israel, R. (2012). Akilli lider. Cev. Serdar Ucar. 3. Baski. Istanbul: Alfa. Chiou, C. C. (2015). The Comparative Effect of Computer-Assisted and Paper-and-Pencil Concept Mapping on Learning Motivation and Achievement. International Journal of Information and Education Technology, 5(9), 668- 680. Clark, D. (2010). Bloom's taxonomy of learning domains: The three types of learning. from http://www.nwlink.com/~donclark/hrd/bloom.html. Costley, K. C. (2014). The Positive Effects of Technology on Teaching and Student Learning. Online Submission from http://eric.ed.gov/pdf. Dhindsa, H. S., & Anderson, O. R. (2011). Constructivist-visual mind map teaching approach and the quality of students’ cognitive structures. Journal of Science Education and Technology, 20(2), 186-200. doi: 10.1007/s10956- 010-9245-4. Dhindsa, H. S., Kasim, M., & Anderson, O. R. (2001). Constructivist- visual mind map teaching approach and the quality of students’ cognitive structures. Journal of Science Educational Technology, 20, 186–200. doi: 10.1007/s10956-010-9245-4. Dormer, S. (2009). Mind mapping. Tuggeranong, Australian Capital Territory: ACT Centre for Teaching and Learning. From http://activated.det.act.gov.au/learning/word/elt/7.0_MindMapping.Pdf. Evrekli, E., & Balim, A. G. (2010). The research on the effects of using mind maps and concepts maps in Science education on students’ academic achievements, inquisitive learning skills perception. Western Anatolia Journal of Educational Sciences (WAJES), 1(2), 76- 98. Fang, M. (2013). Research on the effect of mind map on chemistry learning during the period of overall review[D]. Dissertation. 2013. Forehand, M. (2010). Bloom’s taxonomy. Emerging perspectives on learning, teaching, and technology. Gallagher, C., Hipkins, R. & Zohar, A. (2012). Positioning thinking within national curriculum and assessment systems: Perspectives from Israel, New Zealand and Northern Ireland. Thinking Skills and Creativity, 7, 134-143. Betancur, M. I. G., & King, G. (2014). Using mind mapping as a method to help ESL/EFL students connect vocabulary and concepts in different contexts. Revista Trilogía, (10), 69-85. Guliz Aydin, G. (2015). The Effects of Technology-Supported Mind and Concept Mapping on Students’ Construction of Science Concepts:The Effect of Mind Mapping in Science Education. Anthropologist, 20(1,2), 166-176. Hong, S. Y., & Diamond, K. E. (2012). Two approaches to teaching young children science concepts, vocabulary, and scientific problem-solving skills. Early Childhood Research Quarterly, 27, 295– 305. Jafaree Harandee, R., Meer Shah Jafaree, E., & Leeyaghatdaar, M. (2009). 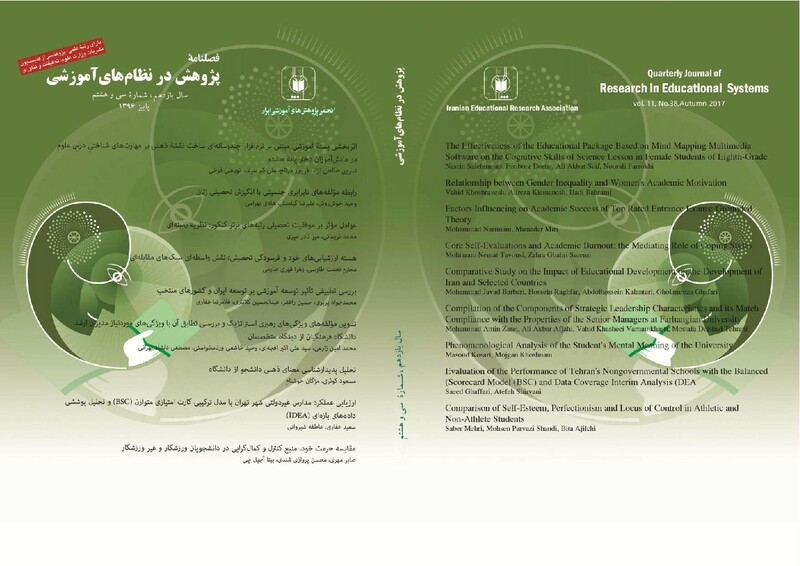 A comparison of science education curricula in Iran and few other countries. Journal of New Thoughts on Education, 5(2), 145-193. Karadeniz, O., Tangulu, Z., & Faiz, M. (2013). Ortaokul 6. sinif sosyal bilgiler dersinde zihin haritalama teknigi kullanilmasinin ogrencilerin akademik basarisina etkisi. Giresun Universitesi Karadeniz Sosyal Bilimler Dergisi, 8, 131-142. Karamustafaoglu, S. (2010). Evaluating the Science Activities Based On Multiple Intelligence Theory. Journal of Turkish Science Education, 7(1), 3-12. Mareš, J. (2010). E-learning, který využívá k učení objektivní I subjektivní mapy pojmů, Information and Communication Technology in Education. Ostrava: Repronis, 17-33. Merchie, E., & Van Keer, H. (2012). Spontaneous Mind map use and learning from texts: The role of instruction and student characteristics. Procedia - Social and Behavioral Sciences, 69, 1387 – 1394. Mitchell, E., & Smith, S. (2009). Instructional Design & Educational Technology Tips. Free Mind Mapping Software, Wake Forest University. Mona, I. A., & Khalick, F. A. (2008). The influence of mind mapping on eighth graders’ science achievement. Mtebe, J. S., Mbwilo, B., & Kissaka, M. M. (2016). Factors Influencing Teachers’ Use of Multimedia Enhanced Content in Secondary Schools in Tanzania. International Review of Research in Open and Distributed Learning, 17(2), 65- 84. Nilsson, P. (2015). Catching the moments – coteaching to stimulate science in the preschool context. Asia-Pacific Journal of Teacher Education, 43(4), 296-308. Pappas, E., Pierrakos, O., & Nagel, R. (2013). Using Bloom’s Taxonomy to teach sustainability in multiple contexts. Journal of Cleaner Production, 48, 54-64. doi: 10.1016/j.jclepro.2012.09.039. Peterson, S.M. (2009). Narrative and paradigmatic explanations in preschool science discourse. Discourse Processes, 46(4), 369-399. Polat, O., Yavuz, E., A. & Tunc, A., B., O. (2017). The effect of using mind maps on the development of mathematics and science skills. Cypriot Journal of Educational Science, 12(5), 32-45. Rabiei, M., & Talebian, M. H. (2011). Instructional technologies in science. Educational Technology Roshd, 28(1), 34-37. Sadr al-ashrafi, M. (2007). Apllication of standards for teaching science in Iran. Journal of Technology and Education, 1(4), 217-237. Saido, G. M., Siraj, S., Bin Nordin, A. B., & Al_Amedy, O. S. (2015). Higher Order Thinking Skills among Secondary School Students in Science Learning. The Malaysian Online Journal of Educational Science, 3(3), 13- 20. Salman Sabbah, S. (2015). The effect of college students' self-generated computerized mind mapping on their reading achievement. International Journal of Education and Development using Information and Communication Technology (IJEDICT), 11(3), 4-36. Schaal, S. (2010). Enriching traditional biology lectures-digital concept maps and their influence on achievement and motivation. World Journal on Educational Technology, 2(1), 42-54. Serig, D. (2011). Beyond brainstorming: The mind map as art. Teaching Artist Journal, 9(4), 249–257. Stoica, I, Moraru, S. & Miron, C. (2011). Concept maps, a must for the modern teaching-learning process. Romanian reports in physics, 63(2), 567–576. Tipper, M. (2008). Why­ do I have to Use Keywords When Mind Mapping?. MichaelonMindMapping.com, Sept 4th 2008. Tseng, K.-H., Chang, C.-C., Lou, S.-J., Tan, Y., & Chiu, C.-J. (2012). How Concept-mapping Perception Navigates Student Knowledge Transfer Performance. Educational Technology & Society, 15(1), 102–115. Wheeldon, J. (2011). Is a Picture Worth a Thousand Words? Using mind maps to facilitate participant recall in qualitative research. The Qualitative Report, 16(2), 509-522. Williams, M. H. (2012). Physical webbing: Collaborative kinesthetic three-dimensional mind maps. Active Learning in Higher Education, 13(1), 35–49. doi: 10.1177/1469787411429185. Yahya, A. A., Toukal, Z., & Osman, A. (2012). Bloom’s Taxonomy-Based Classification for Item Bank Questions Using Support Vector Machines. In Modern Advances in Intelligent Systems and Tools Berlin, Germany: Springer, 135-140. Liu, Y., Zhao, G., Ma, G., & Bo, Y. (2014). The effect of mind mapping on teaching and learning: a meta-analysis. Standard Journal of Education and Essay, 2(1), 17-31. Zachariades, T., Christou, C. & Pitta-Pantazi, D. (2013). Reflective, systemic and analytic thinking in real numbers. Educational Studies in Mathematics, 82(1), 5-22. doi: 10.1007/s10649-012-9413-y.